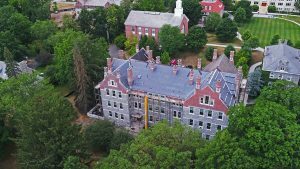 The Fania Roofing Company is honored to have recently provided roofing services for the esteemed Blair Academy in Blairstown, NJ. 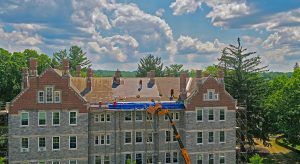 Fania completed an extensive roof renovation to the Clinton Hall building which was originally built early in the 20th century. In 1992, the School was entered into the National Register of Historic Places in recognition of its historic and architectural significance. 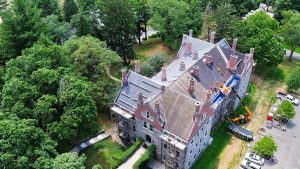 The project encompassed removal of the existing synthetic slate roofing material which was installed approximately 10 years ago. The synthetic slate product was failing tremendously with evidence of curling and breakage. The roof was also leaking. The academy contacted us during an emergency situation that required an upscale roofing professional to address the issues in a timely manner. 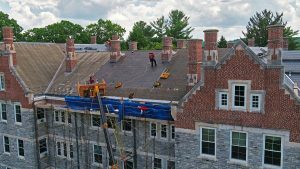 This project also required a company with the ability to not only address the urgency of the roof failure, but also one that had the rapport with a high-end slate company and the ability to coordinate the removal and roof replacement. The scope of this project included removal of the existing synthetic roofing, as indicated above, removed the existing snow guards and all of the copper flashing. We then installed new ice and water shield underlayment and felt paper. The next step encompassed the installation of a natural slate roof system from North Country Slate, all new 20 oz lead coated copper flashing and re-installation of the snow guards. Fania was able to complete the entire project on a tight timeline as the work had to be completed while the students were on summer vacation. This project serves as proof of our dedication to providing a high-end quality product with the customer service to match! No matter the age or historical status of your building, The Fania Roofing Company is qualified to service its roof, and we’re always honored to be called. We are extremely proud of our work on historic buildings, including Blair Academy’s Clinton Hall building. What kind of roof does your historic building or property have? The Fania Roofing Company is your New Jersey, New York and Pennsylvania roofing resource, and we have skilled craftsmen specializing in each kind of roofing material.